Learning, learning, everywhere. Every once in a while we take a minute to marvel at the internet and the opportunities it brings to anyone looking to develop new skills. Now, online learning platforms are popping up left and right. If you’re looking to make a hobby out of game design, or try it for a high school project, or pursue it professionally—you can learn everything you need just by firing up the ol’ MacBook. 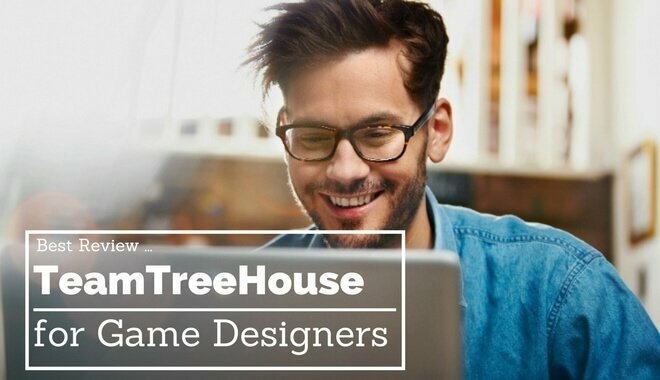 Today, we’re looking at TeamTreeHouse—specifically their game design and development courses. But do the folks at TeamTreeHouse deliver? Let’s take a look inside this colorful platform and see how their Game Design/Development courses stack up against the greater web. How Much Does TeamTreeHouse Cost? TeamTreeHouse offers three plans. Ideally, your learning needs will fit somewhere in there. And, with the Basic Plan and the Pro Plan, if you haven’t already signed up for it, you get a free 7-day trial! You can get a whole first exploratory week, on the house. Not bad. The Basic Plan costs an easy $25 per month. That ends up being $300 a year (for those of you keeping score at home). This seems pretty standard for online learning platforms. The price isn’t too steep, and the fact that it’s monthly means you can subscribe and unsubscribe as you see fit. You can spend a month entrenched in a course, for hours on end, making huge advancements in the skill—only to find you don’t want to go through any more courses. And it’d only cost you $25 for the month. Hard to beat pricing like that. Let’s see what else they got. The Pro Plan doubles down, at least on what you owe, with a monthly price of $49. So for an extra 24 bucks you can learn offline, get help from other “pro” subscribers, and peep some exclusive talks with industry leaders. And you get the Code Challenge Engine, which sounds like it could be pretty helpful. This could be worth it. If you’re learning a lot on the go, because you travel or because that’s just the nature of your life, then the offline learning might be a big help. Exclusive talks…well, it’s likely that the people speaking for TeamTreeHouse have spoken elsewhere—a quick YouTube search would likely turn something up. Ok, Treehouse for Teams is probably not the plan for you, considering you’re likely an individual. But who knows, we’ll cover it anyway. There’s no price, because the price will depend on the size of your company and the scope of what you’re hoping to accomplish. Now you know, for when you start that indie dev company. This was part of Petti’s announcement of one of Treehouse’s newest subjects: Game Development. The instructor is Nick Pettit. He has 15 years of experience as a programmer. His “most recent game for Windows, Mac, and PlayStation 4 was Greenlit on Steam in just 5 days and raised over $10,000 on Kickstarter.” Which isn’t too shabby when you consider how many games are vying for attention these days. The course is for beginners, and will walk you through every line of code. You don’t need any prior programming experience. And the list goes on, including subjects like game audio, and “building” and sharing a Unity Game. If you’re not interested in making a frog hop game, you can check out a few of the other courses that the platform has available. You’ll work with Maya, as the course title suggests, and you’ll learn to apply color, use modeling tools, and make use of texture maps. This is a course for beginners. Each course has a trailer you can watch if you’re not sure of what to expect. Any Extra Considerations for TeamTreeHouse? As if the price and the content weren’t already worth giving TTH a shot, they had to go and throw in some perks. For the price, the teacher experience, the course content, and the perks, it’s hard to find a better online platform to kick off your learning career. And with a free seven-day trial, you have no excuse not to try it out for yourself!